Sometimes having a roommate makes all the difference in renting a home. You have someone to depend on for their personal share of the errands and rent, and the two of you can keep each other company even during the busiest of days in the office. Our luxury two-bedroom Houston apartment floor plans at Alexan CityCentre are perfect for sharing, whether you intend to bring a friend, a co-worker, a family member, or even a significant other. 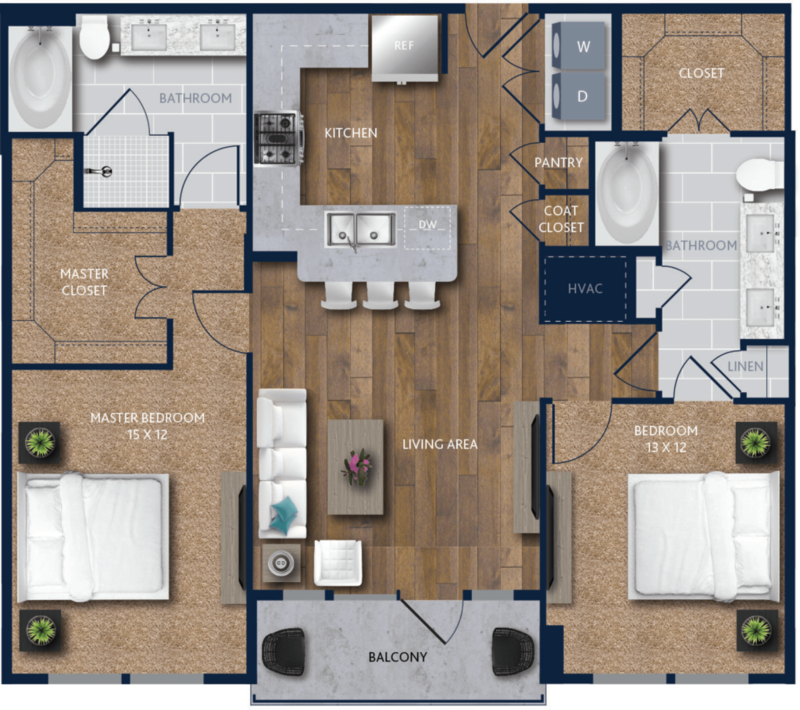 The first of our luxury two-bedroom floor plans, the B1, is the perfect crash pad for roommates or single residents alike, fitting up to 1,181 square feet of comfortable and stylish living space. The two bedrooms stand on opposite ends of the apartment, allowing you and your neighbor some much-needed privacy during the early and late hours of the day. They both have enough room to accommodate a plush king-sized bed, feature their own expansive walk-in closet to organize outfits and clutter with ease, and connect to a spa-inspired bathroom complete with a large soaking tub and double vanity sinks. Receive your guests with gusto or wrap yourself up against cold and wet weather using the convenient coat closet right by the front door. Serve up your favorite snacks and meals in our open kitchen, complete with a raised breakfast bar and ample pantry space. Lounge back and enjoy game nights together in the wide living room. Finally, step out onto the spacious private balcony and admire lovely views of Houston and our luxury community. Share the best of home comforts here at Alexan CityCentre. Schedule a tour of the B1 and our other remarkable luxury two-bedroom Houston apartment floor plans this weekend.